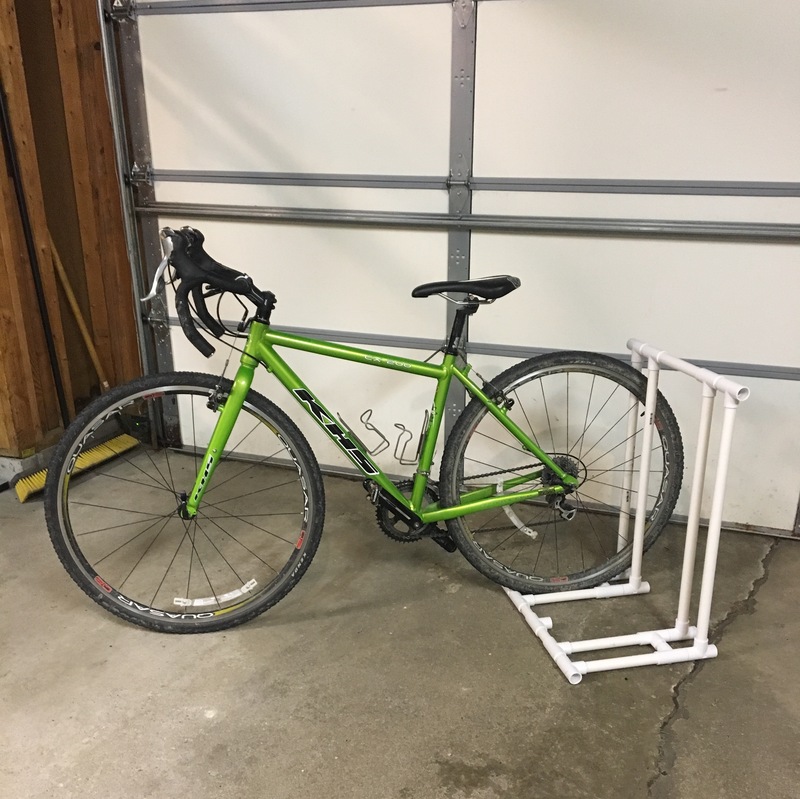 This article describes my process of designing and building a PVC bike rack to better store multiple bikes in our garage. I’ve included what features we wanted to include, the exact specifications, a materials list, and a rough cost estimate. (Spoiler alert – you can build a 5 bike rack for about $30!) If you have questions, please comment or send me a note! I’m happy to help. Our household MAY have too many bikes. How many is too many? Well, we’re not going to get into that. Let’s just say not all of them get ridden often enough for my taste. 😉 Since we really don’t want to get rid of many of them, we decided we needed a better bike storage system for the garage. 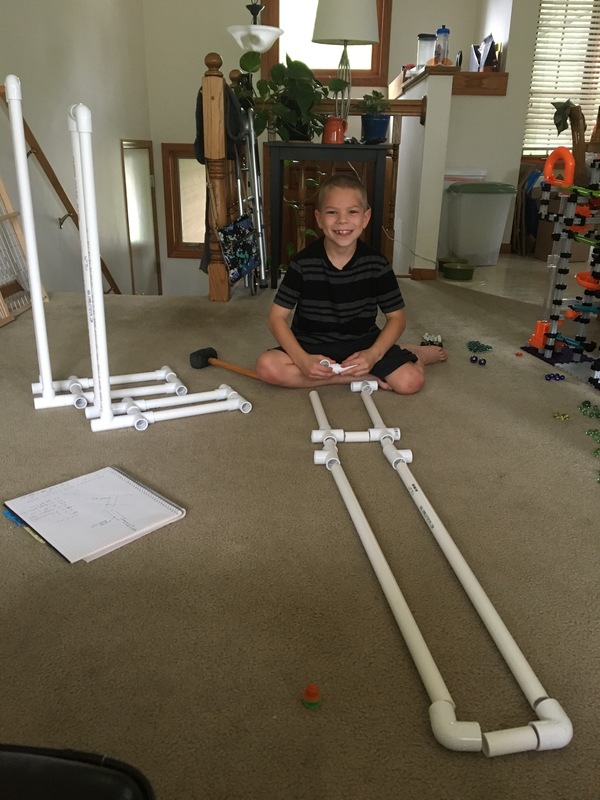 I documented the plans, specifications, and final results of our homemade PVC bike rack in this blog. The finished rack! It’s not perfect — not bad for our first attempt, but I cover design upgrade options at the end of the post. Many of the bikes in our household hang on the ceiling. However, I’m short enough (5’1″ish) that getting bikes off the ceiling regularly is a precarious task. It often involves some jostling, holding of my breath as I grunt and “clean and jerk” the bike off of the floor like it’s a bar bell with weights. Once it’s in the air I have to try to hold it above my head and get the wheels on the ceiling hooks. It is NOT fun. I decided we needed some way for me to store my frequently used bikes on the ground. There are many commercial options available for bike racks, but we decided to be crafty and build our own. We wanted custom spacing, options to fit multiple styles of bikes, and it needed to fit snugly in between two existing shelving units in the garage. My job was to design it, and the boys of the house put it together as I’m still mostly laid up. Free labor! Hand your elementary school-aged kid the parts and a schematic and tell them it’s just like building Legos. The rack is made of 3/4″ schedule 40 PVC piping and fittings available at any hardware store. We made one “fat bike” slot, and the other slots are versatile enough to hold road bike tires up to non-plus size MTBs. 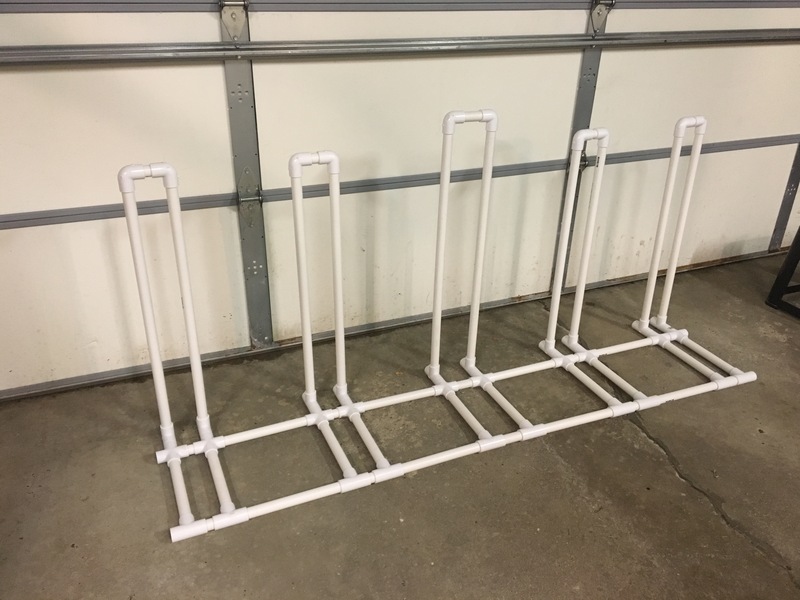 Our PVC bike rack will hold a total of 5 bikes, and we had enough extra parts left over to make another small 2 bike rack to hold the kiddo’s or guests’ bikes! I’ll go through what you need to buy to build one slot for a bike — multiply the parts list below depending on how many bike slots you want to build. All fittings were compression-fit (not screwed), and we didn’t bother to use any solvent or glue to join the pieces together. The rack was quite stable as-is so I wouldn’t bother with the chemicals. Total cost to build this PVC bike rack INCLUDING THE MODIFICATIONS BELOW would be about $30 plus tax and your time. This was our household’s first go-around building a PVC bike rack. I designed the rack based on a combination of factors. I had scoured the internet for plans and also took measurements of a single-bike metal rack we had in the garage that everyone loves. The rack also had to fit in a very specific-sized nook in the garage. I don’t think this design is identical to anything else out there right now. 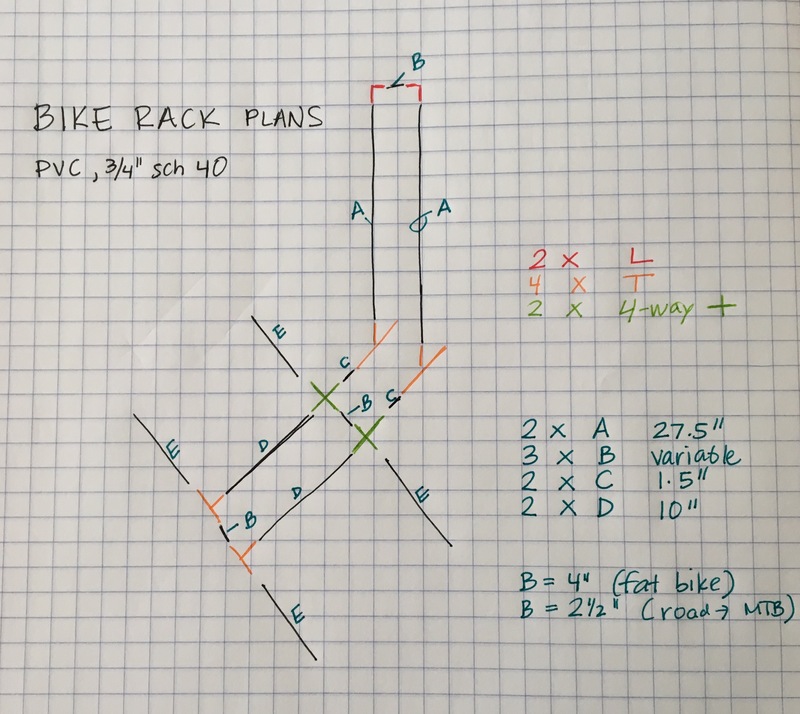 There are a lot of ways to get this done, but I had trouble finding a site that systematically explained the sizing and fittings needed to build a multi-bike rack. The PVC pipes labeled “B” in the above diagram set the spacing between the vertical risers and the floor supports. If you adjust their size, you adjust the size of tire that will fit in an individual slot. We went with 4″ inserts for fat bikes and 2 1/2″ inserts for road up to non-plus MTBs. Connectors are either T’s, 4-way crosses, or L’s in our rack. A future design could use only T’s — more on that later. T’s come in bags of 10 at some hardware stores for about $3. This is typically a much cheaper way to purchase fittings. The most costly fittings were the crosses, coming in at just under $2 each at our local home improvement store. Ouch! Cut the PVC pieces as listed above in the picture. 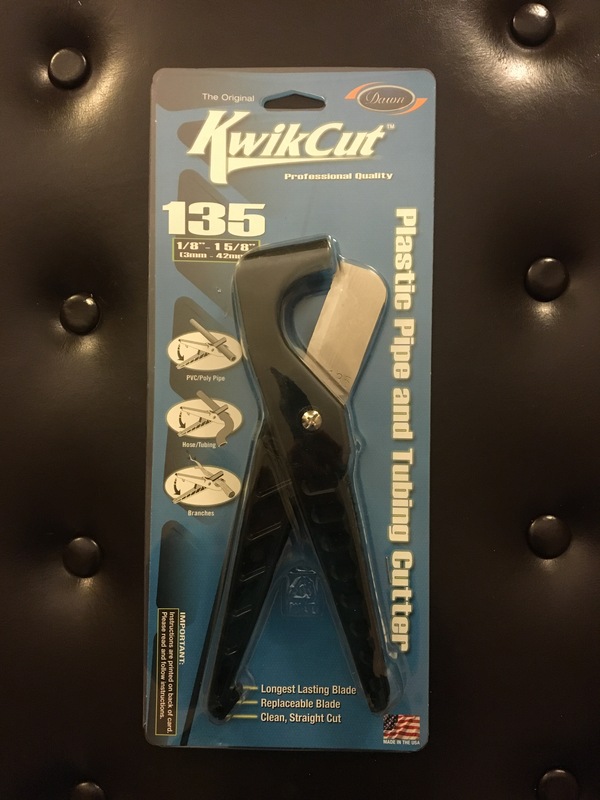 We purchased a cheap but effective PVC cutter to help speed up the process and make straighter cuts. I’m sure a more expensive cutter would require less elbow grease to cut things, but this one worked fine for the limited number of cuts we had to make. Here’s a link to the cutter we used! Loosely piece together the PVC sections and fittings per the drawing above. We “hand fit” everything first, and then used a rubber mallet to tap the pieces together. In theory, I think the PVC would insert at a 1″ depth into the fittings if you walloped everything together. Since in this application the PVC doesn’t need to hold pressure I assumed we’d get fittings to approximately a 3/4″ depth. Your mileage may vary if you use more or less force. Here is our finished product, holding a selection of random bicycles (a gravel bike, a 29 inch MTB, and a fat bike). Bikes can be placed in the rack forwards or backwards, and the PVC bike rack is really stable even with just one bike placed on an edge slot. Like I mentioned earlier, this was our household’s first go-around building a PVC bike rack. Perfectionist-me wants to go modify the rack to make it better, but it’s good enough as-is. However, if I were to do it again (or start fabricating multiple PVC bike racks), I’d make some changes. The fat bike slot is randomly taller than the other slots due to our trial-and-error process. In the future, we’d make it the same height as the other slots with vertical supports that measure 27.5″ when cut. Also, the design could be improved to not require specialty fittings, only the T’s. T’s come in bags of 10 at some home improvement stores, which is a MUCH cheaper way to buy fittings. Instead of using L’s at the top of each vertical support, I would use a T in the future and connect the vertical supports to give the rack rigidity. I built something similar for my fat bike – there was no way I was hanging that beast from the ceiling. Did you glue the pieces together or just use the friction fit? We just friction fit everything! It seemed really stable, and fingers crossed it stays that way after use. Before this rack BOTH of our fat bikes were on the ceiling, and we have heavy older models! EEEEK. Did you friction fit yours or use glue?